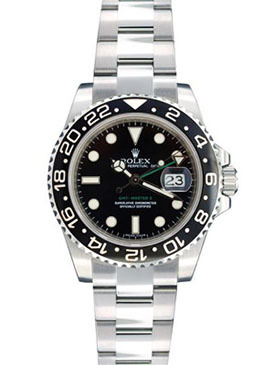 Item number: 116710 Brand Name: Rolex Style Number: 116710 Also Called: New GMT Master II, 116710-78200 Series: GMT Master II Style (Gender): Mens Case Material: Stainless Steel Dial Color: Black Movement: Automatic COSC Engine: Rolex Caliber 3185 (31 jewels, 28,800vph) Functions: Hours, Minutes, Sweep Center Seconds, 2nd Time Zone hand, Date Crystal Material: Sapphire Crystal, flat with raised edges Case Diameter: 40.0 mm Case Thickness: 12.15 mm Caseback: Stainless Steel screw-locked with Rolex logo and rolex dark engraving Bezel Material: Black enameled Ceramic Bezel Function: Unidirectional Rotating with 60 minute diving scale (120 clicks) Water Resistance: 100m / 330ft (suitable for swimming and shallow snorkeling; unsuitable for diving) Crown Material: Screw-locked (Twinlock), protected, fluted, stainless steel with Rolex Crown logo Calendar: Automatic Date at 3 Power Reserve: 47-hour power reserve Watch Bracelet / Strap Material: Stainless Steel Oyster Bracelet with Rolex logo Watch Clasp Material: Triple Folding Clasp with logo. Max Wrist Size: 8.0 inches Watch Bracelet Width: 15.45 - 20.0 mm Additional Info: SuperLuminova luminescent inlay for hour markers and hands. Quick-set hour hand moves in one hour increments. Warranty: ORIGINAL VALID STAMPED INTERNATIONAL ROLEX WARRANTY * If shown above, Bracelet OR Strap lengths are measured to include the watch case and represent the MAXIMUM possible strap length. Gemnation provides FREE bracelet resizing before shipment. If you know the size of the wearer's wrist, please let us know in the 'Special Request' section at the time of checkout and we will size the watch appropriately. Removed links WILL BE SENT WITH THE WATCH. Sizing is not an exact science; bracelet links vary in size and removing too many links or too few links may make the fit too small or too big. We therefore cannot guarantee the length of the bracelet or that it will be equivalent to the specified length. As a result, many of our customers take their watches to a QUALIFIED watchmaker to do the sizing with their watch in hand; expect to pay in the region of $5 - $25 for this service. Watch bracelets that Gemnation resizes are still returnable. Unfortunately if an outside party is utilized to resize the strap, we can no longer accept the watch for return or exchange. Unforeseen circumstances may prevent us from resizing the watch bracelet. If this is the case, we will notify you before shipping the watch. Sizing requests are usually completed within 24-48 hours. If overnight shipping is selected in addition to bracelet sizing, please allow for additional time, or contact us beforehand to provide us with sufficient time to accommodate your request. Есть вопросы по Rolex 116710 GMT-Master II?